Did you think that famous meat-monger, Nathan Anda, would stop at putting just one kind of protein on his latest meat-sterpiece? 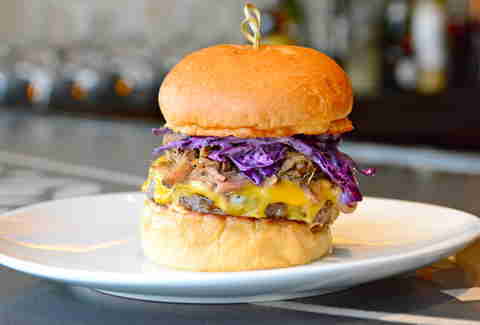 If so, you don’t deserve the Smokehouse Burger, piled high with pulled pork, red cabbage slaw, and American cheese. What makes the burger sing (like a B-side track) is smoked BBQ aioli. Anda smokes Duke’s mayo over high heat and lets it re-emulsify. We’ll get to the patty, but the polenta fries must be addressed immediately. They’re liquid gold. In fact, they’re worth their weight in gold, and you wouldn’t believe how hard they are to make, so savor every nibble. 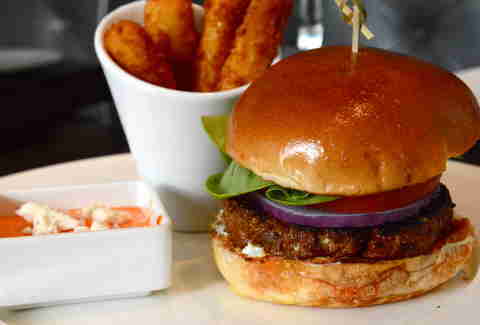 Back to the main attraction: an expertly seasoned, gamey lamb burger made bolder by harissa, feta, and cucumber yogurt. It’s a tall stack, so open wide. The good news is you can get this knockout plate at brunch, lunch, or dinner. 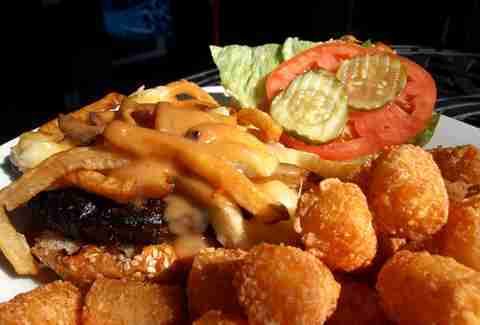 The Satellite Room is serving up a burger topped with the greatest gift our neighbor to the North has given us: poutine. Well, that’s if you don't count Evangeline Lilly. Canada’s concoction of French fries, gravy, and cheese curds come on top of your burger, not beside it, which is so much better. 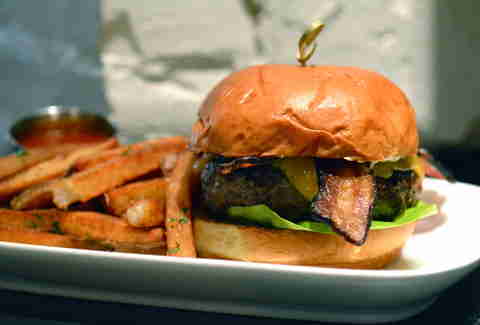 The music-obsessed bar named the burger after Henry Rollins because he helped shape the DC punk music scene of the '80s. You don’t have to like Philly fans, Yuengling suds, or Sidney Crosby to dig the Keystone Burger at this Pennsylvania-themed restaurant. You don’t even have to like Pittsburgh’s Heinz ketchup, because Second State makes its own. The Keystone features an 8oz coffee-rubbed beef patty, aged sharp cheddar, crispy bacon, and red wine shallot aioli -- because you fancy. In celebration of our newfound relations with Cuba, try this ground pork burger with the fixings of a proper Cubano sandwich: bacon, spicy mustard, cheddar cheese, and pickles. 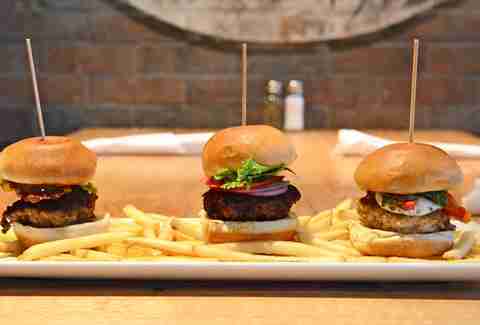 Get a giant one just for you, or try it in Plan B’s burger flight (which gets you three sliders). 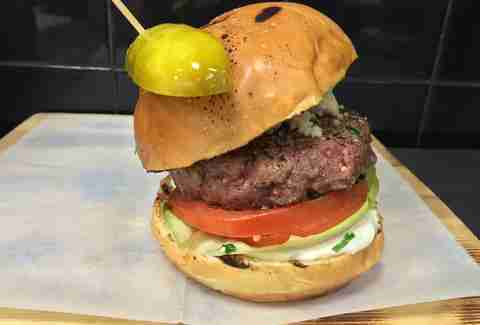 Joining the Cuban Burger are The Italian Job and the classic Tavern Burger. You may end up putting mustard on your burger for the rest of time. 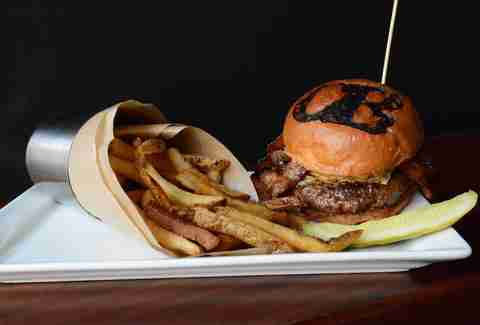 Wagyu beef is between the brioche buns, so you can expect an extra-rich burger experience at Station 4. They get their Kobe-style beef from Snake River Farm (like some Michelin-starred restaurants) and top it with stinky Stilton blue cheese, grilled onions, Boston lettuce, and mayo. Just in case your cardiologist wasn’t already concerned, it comes with a side of duck fat fries. 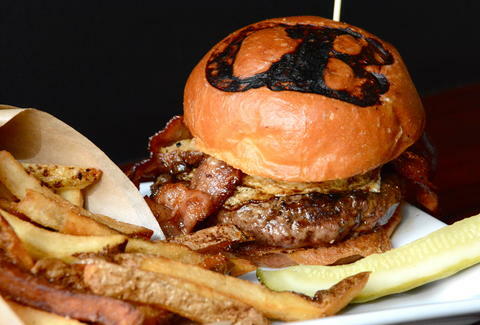 This burger is worth its Andrew Jackson price tag. Stop pretending you go to DC9 for the music or the dancing. You go for the burgers. There’s a new one to add to your roster: The Irish Channel burger, named after the New Orleans neighborhood. It’s 8oz of all-natural beef wearing Guinness caramelized onions, white cheddar cheese, and house-made Creole mustard. Of course it comes with their crave-worthy garlic fries (and house-made pickles). Clarendon just got a Charlottesville, VA transplant in the form of Citizen Burger. The farm-forward burger joint only puts the best ingredients on a bun. Take The Executive for example: truffled brioche plays home to an 8oz Timbercreek patty hiding under decadent layers of foie gras bites, Nueske’s bacon, black onion, fried farm egg, and garlic aioli. It’s a flavor-bomb you won’t soon forget, and the branded bun will remind you where you got it. Word has it, they’re currently looking for space to expand into DC proper.